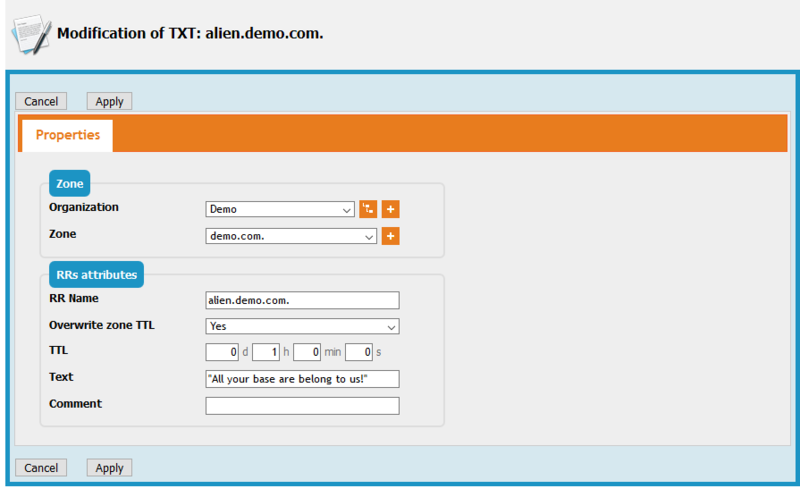 This extension brings a DNS dimension to TeemIp. It allows DDI administrators to manage DNS views, zones and their DNS records. This is done, of course, in close relation with TeemIp objects already defined in IP space and the CMDB. Export zone data or retrieve them through WEB services from DNS master servers. The extension is, today, static. All DNS records need to be created manually through the UI or through imports. No automatic provisioning of DNS records is done from the IP Management modules or from the CMDB, for instance. That should change in the future release coming soon. There is no specific requirements with that extension. 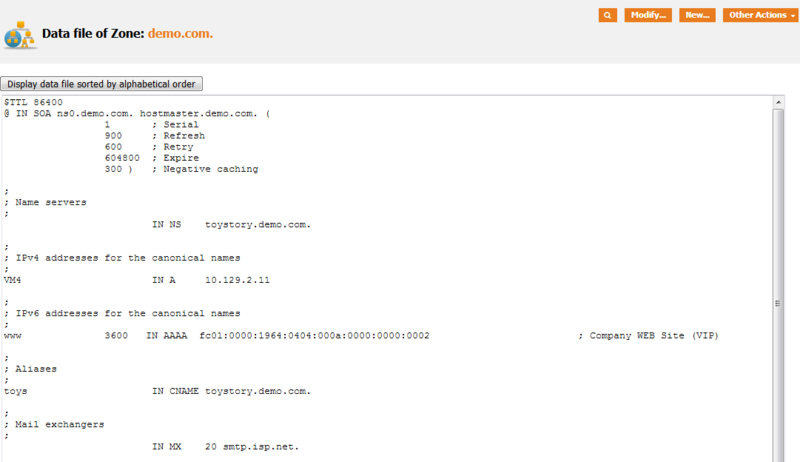 TeemIp DNS Zone Management is anyway already embedded in TeemIp standalone starting with TeemIp 2.4. When installed on an iTop application, make sure that 'IPAM for iTop' is installed as well. Installation on a TeemIp standalone is done with the application itself, through the setup. For iTop 2.4.0 and higher, use the new Standard installation process. For iTop versions older than 2.3.x, use the Special installation process. No specific configuration is required for this extension. This menu integrate TeemIp right after the IP Management menu. It proposes an overview to the different TeemIp objects that are related to DNS as well as a list of shortcuts to directly acces them. These objects modelize the well known domains from the Domain Name Service. Domain objects belong already to TeemIp core modules as documented in the Data model documentation. The DNS Zone Management extension alter them with a new tab that lists the related zones, ie the zones which name includes the domain name. Details of a Domain can be accessed from the specific shortcut available under the DNS Management menu. TeemIp handles DNS views, the solution offered by DNS to handle different communities of hosts that may require specific DNS answers according to the network where their resolution is requested from. Details of a view can be accessed from the specific shortcut available under the DNS Management menu. A given hostname may be resolved into different IPs according to the view it belongs to. This is modelized in TeemIp by making the View an attribute of IP addresses. This is the key object of the DNS world around which everything is built. By definition, the zone is the domain minus what has been delegated from it. 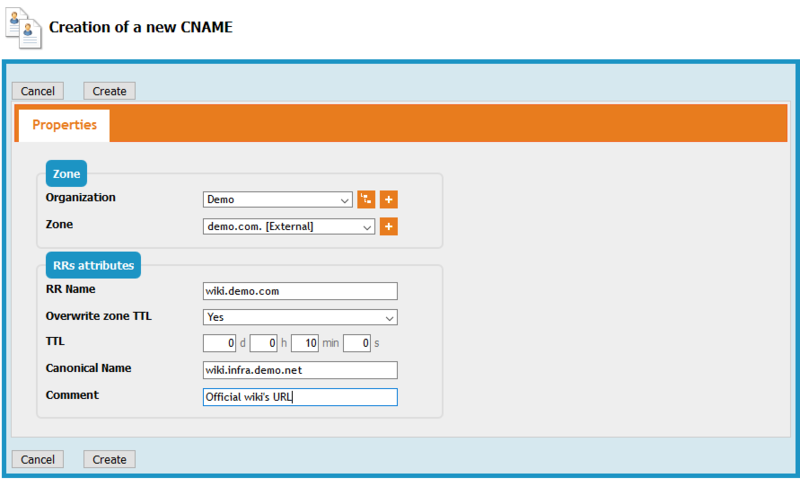 TeemIp DNS Zone Management allows you to generate zones data files. These text files follow the format defined by BIND and can be used as zone master data files in BIND master servers. A zone file can be sorted by records or by alphabetical order. Output file will be displayed in a text box and can easily be copied and pasted to be used within a name servers. Zone files can be programmatically retrieved through TeemIp REST/JSON web services. Please, refer to the related wiki page for further details. Zone data files can be retrieved through a specific WEB service, as documented in the REST/JSON chapter. This feature can be used from a DNS server to build its master data files for the zones it handles. The “zone” attribute points to a forward or reverse zone, according to the record type, filtered by the organization that the zone belongs to. The “RR Name” is just the name of the record, known as the owner in the specialized literature. The default TTL of the zone that the record belongs to, may be overwritten by a specific value specified at the record level. This behaviour is driven by the “Overwrite zone TTL” boolean and the TTL duration. This object is used to document the IPv4 Address record. 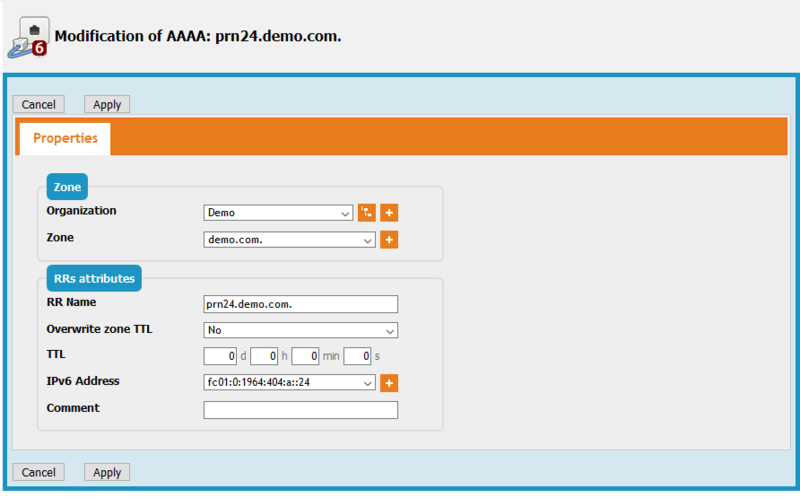 Details of a A Record can be accessed from the specific “A” shortcut menu of the DNS Management module. This object is used to document the IPv6 Address record. An AAAA record may be updated from the detailed view of the object. This object is used to document the Canonical Name record. A new CNAME record may be created from the specific “CNAME” shortcut menu of the DNS Management module. This object is used to document the Mail Exchanger record. 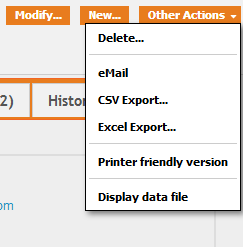 Details of a MX Record can be accessed from the specific “MX” shortcut menu of the DNS Management module. This object is used to document the Name Server record. 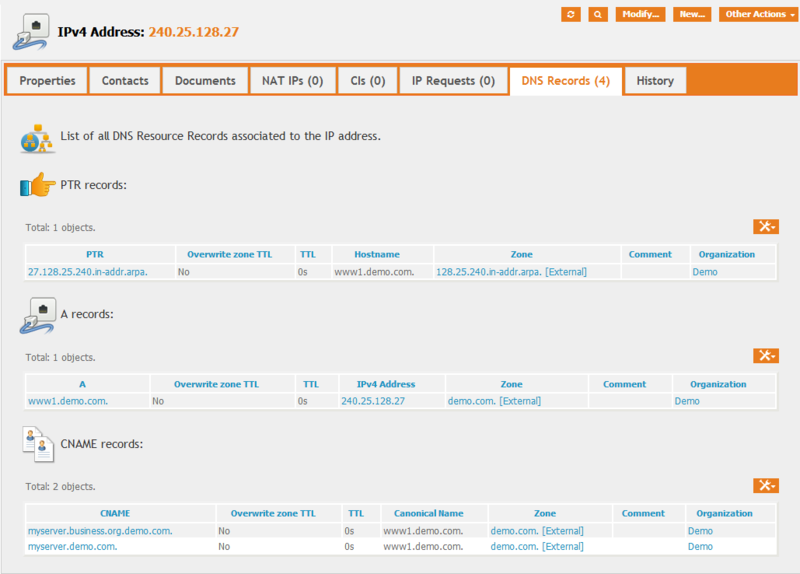 Details of a NS Record can be accessed from the specific “NS” shortcut menu of the DNS Management module. This object is used to document the Pointer record. This object is used to document the Locate Services record. 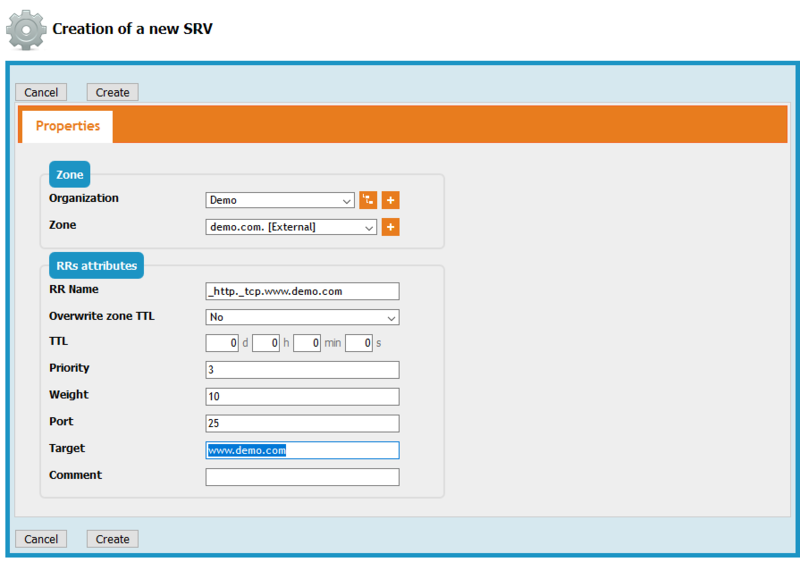 A new SRV record may be created from the specific “SRV” shortcut menu of the DNS Management module. This object is used to document the Text record. A TXT record may be updated from the detailed view of the object. There is an obvious link between IP addresses and DNS records: an IP has a FQDN and aliases may point to that FQDN. As a consequence, A / AAAA, PTR and CNAME records may be associated with IPs. This is what the extension does by adding a “DNS Records” tab to IP Address objects. At this stage, there is no automatic creation, modification or deletion of DNS records when an IP address is created, modified or deleted. This will become available in the next revision of the extension. The TeemIp DNS Zone Management extension brings a new profile dedicated to the management of DNS objects: domains, zones, views and associated resource records: “Hostmaster - DNS”, a “Person handling the DNS space”. It has all rights on the DNS objects. This profile extends capabilities and must be used together with other profiles like ConfigurationManager. The DNS management menu is hidden to the users that don't have read capabilities on zones.